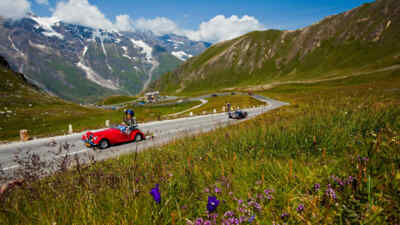 The Grossglockner High Alpine Road is the queen of the alpine roads in Austria without a doubt. Her 48 km promise the most sensational views of numerous 3,000 m peaks and the drive up to an altitude exceeding 2,500 m is an unforgettable experience. 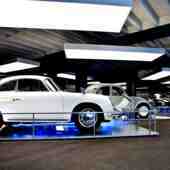 Information points, exhibitions and the visitors’ centre on the Kaiser-Franz-Josefs-Höhe captivate 900,000 visitors a year. But there are other worthwhile alpine roads in Salzburg, Tyrol and Carinthia beyond this great mountain pass that we’d like to introduce to you. 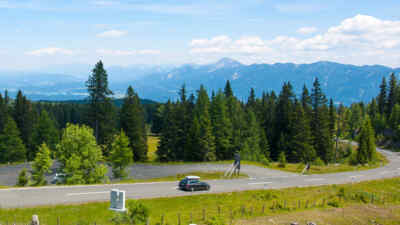 The mountain road that opened in 1965 covers an altitude difference of 1,202 m over 16.5 km before reaching its destination, the Rosstratte car park at 1,732 m. Viewing platforms and eleven car parks offering enjoyable views of Villach, the Karawanks, the Julian Alps and the largest rockslide area in the Eastern Alps at the southern face of the Dobratsch can be found along the road. The summit of Dobratsch is within a 90-minute walk from the Rosstratte. Tip: observe numerous chamois between the rocks on the panoramic summit path! 5.5 million visitors stop by the striking mountain with a view every year: nature trails, the presentation “Herrscher der Lüfte” (Eng. “Rulers of the Sky”), playgrounds, rest stops and hiking options provide entertainment. More information about the year-round Villach Alpine Road! The drive from Mittersill in Salzburg and Zell am Ziller in Tyrol takes about an hour. Set a bit more time aside as there is a lot to see, especially on the 12 km Gerlos Alpine Road between Krimml and Gerlos. 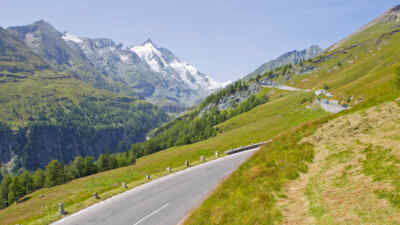 Nine turns with a mild maximum gradient of 9% lead you to the 1,628 m high pass. 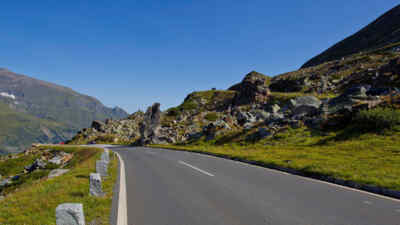 The characteristic style of Franz Wallack, architect of the Grossglockner High Alpine Road, has left a distinctive mark on this route, as its trace is embedded neatly into the natural scenery. 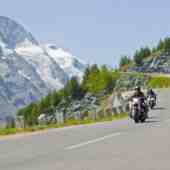 The mountain pass, which is particularly popular with motorcyclists, has been completely open for traffic since 1962. 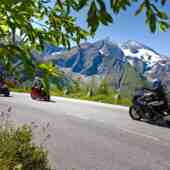 Tip: visit the WasserWelten Krimml right at the beginning of the Gerlos Alpine Road! With a drop height of 380 m, they are Europe’s tallest waterfalls. Details about the year-round Gerlos Alpine Road! More about the WasserWelten Krimml! 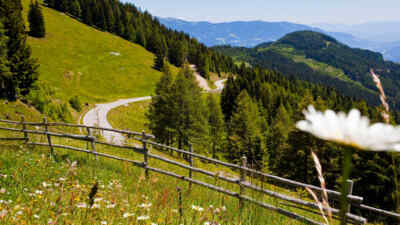 The alpine road open from early May to late October meanders through the area of the gently rounded “Nocken” and the largest larch and stone pine forests in the Eastern Alps for 35 km. Experience one of Austria’s most beautiful nature parks with a total of 52 turns and a pass altitude of 2,042 m. Drive the road from Ebene Reichenau in the south to Innerkrems or the other way around! Exhibitions, an alpine farming museum, animal displays and the 3D cinema at the biosphere park Zentrum Nockberge guarantee just as much variety along the road as the numerous inns that serve original Carinthian delicacies. Tip: a 19th century-style cure treatment at Karlbad followed by a visit to the thermal pool in Bad Kleinkirchheim with water from the karst at the biosphere park Nockberge. Yes, I’d like to find out more about the Nockalm Road! Reach the arrival point at an altitude of 1,895 m via the 14.5 km mountain road starting in Zlan from mid-May to mid-October. 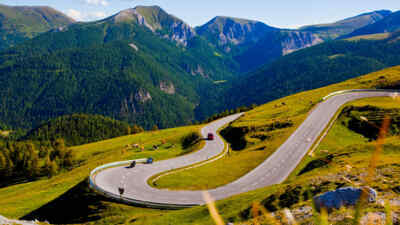 The panoramic road leads up to the mountain in ten turns – and the view becomes wider and grander with every curve. Lake Millstatt and the Millstätter Alpe, the Julian and the Carnic Alps and the Drauntal down to Villach spread before your very eyes! The hiking trail from the highest car park Seetal to the Goldeck summit with an approx. walking time of 45 minutes is particularly worthwhile. Stop by one of the huts or mountain pastures during your drive home and enjoy delicacies from the Carinthian cuisine with the delightful mountains in view. Tip: visit the enchanting Lake Millstatt before or after your trip on the Goldeck Panoramic Road. Further details about the Goldeck Panoramic Road! 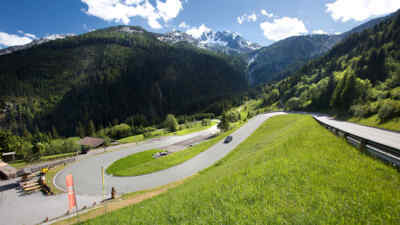 The panoramic and mountain pass roads are just as popular among drivers of vintage cars, convertibles and motorbikes as they are among enjoyment drivers looking for a special driving experience in the Alps. The enjoyment drivers’ brochure gives you tips for all five alpine roads on 96 pages: discover tour suggestions, accommodation and rest stop options, opening hours and important contact information. 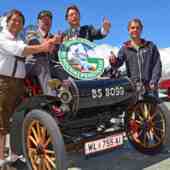 You can order the useful brochure for free by sending an e-mail to info@grossglockner.at or cou can alternatively download the enjoyment biker brochure for free here.